Hamsters possess lateral cheek pouches that help them hoard food for later use. The coarse inner surfaces keep precious food in place so that nothing accidentally spills out. The pouches also are free of salivary glands, and as a result encourage freshness of sustenance while these tiny rodents travel from one point to the next. Other select animal species have similar convenient pouch adaptations. Two members of the squirrel family have food pouches -- the chipmunk and the ground squirrel. Chipmunks are predominantly omnivorous rodents that utilize their roomy cheek pouches to the greatest of their advantage -- by filling them with sustenance to transport back to their cozy dens. The pouches are so massive that they are capable of blowing up to approximately three times bigger than the chipmunk's head size, according to the Connecticut Department of Environmental Protection. 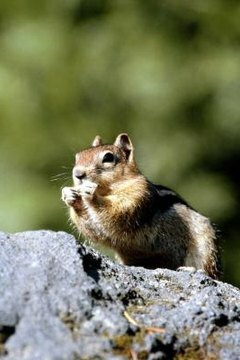 Chipmunks pack their round cheeks full with everything from grains and nuts to bugs and tiny frogs -- all dietary staples for them. Old World monkeys, unlike New World monkeys, also have pouches for food stashing, which are referred to as "buccal pouches." Macaques are one specific example of monkeys with food pouches. Within the monkey world, these pouches are essential for maintaining food for brief spurts of time -- until the animal has the opportunity to chew it safely without having to divide it up with anyone else. When it comes to especially valued foods -- like meat -- Old World monkeys often display intense rivalry. Platypuses are also food pouching creatures. The duck-like mammals have pouches that are situated directly in the back of their bills. When they track down food in the water, whether worms, shrimp or larvae, they immediately store away their sustenance inside of the pouches. Once the animals swim back up to the surface of the water, they then munch on the prey they hid inside of their pouches. Although gerbils appear physically similar to hamsters in a lot of different ways, they do not have cheek pouches. However, just like their close rodent relatives, they also are big time hoarders, according to the RSPCA. Free roaming gerbils often construct elaborate and large sustenance storage burrows. These little creatures definitely think ahead.